But we’ve never done that before. But it will mean more work for our staff. But we don’t know what crazy thing might happen. 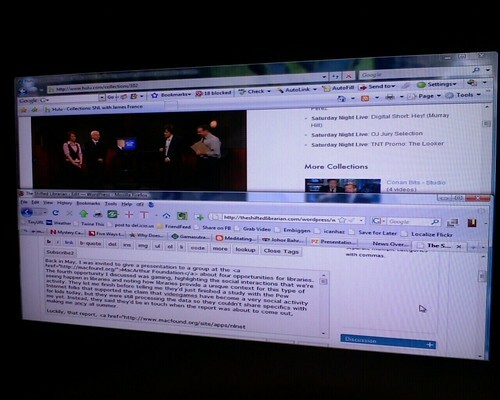 This makes my user experience easier and more convenient, which I really appreciate. 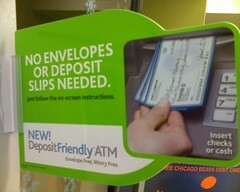 And of course, those who still want to use envelopes can do so. What small things can your library do to make your services (both in your building and online) easier and more convenient for your users? Earlier this week, I stayed at the Marriott Metairie hotel in New Orleans, because I was in town to give a presentation for SOLINET. I’ve been staying in Hampton Inn hotels whenever possible lately, because they have very comfortable beds, offer free wifi, and provide free breakfast (all at a great price), so I haven’t been in an upgraded Marriott lately. Let me tell you, though, that if more Marriotts are upgrading to be like the Metairie, I may just be switching, because this was the most awesome, techno room I’ve ever stayed in. At first, I was just thrilled to see the reading lights on the headboard and the easily-accessible outlets near the bed. And of course there was a nicely-largish LCD TV. These touches are much appreciated, but what actually made me gasp out loud was the A/V panel. Yes, you read that right, the A/V panel. 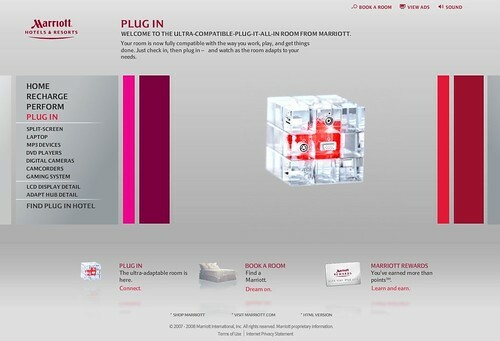 Apparently this is part of a service called Plug into Marriott, and it’s a traveling geek’s dream come true. In fact, I’d love to have one of these in every room in my house! 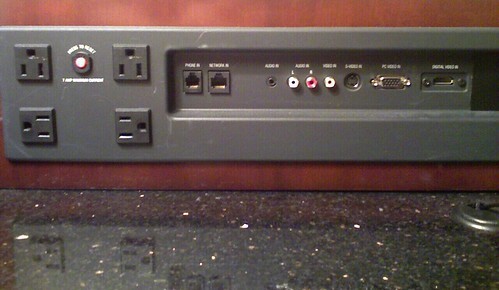 The panel has four surge-protected outlets, an ethernet port, an audio-in port, RCA jacks, an S-Video port, a computer video port, and even a memory card reader. This means you can plug in your laptop (to do work or watch a DVD), an MP3 player to listen to music, a digital camera to view pictures, or a camcorder to watch videos. You can even plug in a game console, and in fact they actually encourage this by including this information in the documentation. 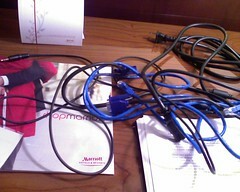 Equally important, the hotel provides all of the cables, since most of us don’t carry these things around. The documentation could use a little help (it tells you to use the TV/video button to get to the different options, but the old remote in my room only had a “function” button that I correctly guessed would do the trick), and the split-screen for working/watching never kicked in, but I was able to watch TV shows on Hulu and listen to music from my iPod through the television set. This whole concept is a great example of saying “yes” and making things easier for customers, as opposed to saying “no,” which is what most hotels do by disabling the ports on the back of the TV in the room. It’s a good lesson for libraries how easy it is to make the user experience better. There’s a directory of “plugged-in” Marriotts on the site, and it looks like there are quite a few of them. I’ll definitely be looking at these as I travel, although realistically, if the rooms cost substantially more and I then still have to pay for internet access on top of that price, I’m likely to stay with my Hampton Inns. Still, this appeals to the geek in me, and I think it shows how digital our media is becoming, as well as how expectations around using that media continue to march forward.